Located on the ground floor of the I-Zone loft building which happens to be conveniently located at the bottom of my stairs. Owners Grant and Kramer are almost always behind the bar that opens at 5pm everyday but Sunday. This tiny stylish bar is one of my mainstay spots after finishing up deals in the evenings. They have 2 beers on tap both from Mill St and amazing selection of spirits. 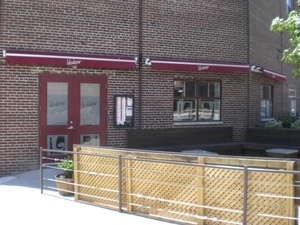 This venue also features on of the largest patios on the East side that definitely heats up during the summer months. Check out the beautiful aquarium featuring a large selection of African Cichlids for all you aquarium nerds out there. Kramer also does a beautiful job with his gardening on the patio.